Powers/Abilities: Prior to his transformation, the Griz had the strength and abilities of an average middle-aged man. Mutated through exposure to unidentified radioactive chemicals, he was transformed into a human-rat hybrid able to communicate with rats exposed to the same chemicals. The Griz also sprouted bone claws from his wrists, was able to track specific scents, and gained regenerative powers apparently able to bring him back from the brink of death. The full extent of the Griz's powers, strength and other abilities is unrevealed. (Slingers#1 (fb) - BTS) - After graduating from high school, Mac Garrity went to work for the New York Transit Authority, working out of a station near Empire State University. (Slingers#8 (fb)) - Feeling that he'd worked his whole life and had little to show for it beyond a small pension and an ulcer, Garrity accepted a job working underground construction on the new Grand Royale hotel. While transporting barrels of an unidentified radioactive element in the rat infested basement, Garrity was knocked off a platform, taking a barrel with him. Covered in the barrel's contents, Garrity's flesh was burned and scarred. (Slingers#1/Slingers#8 (fb)) - Garrity's flesh healed, but he still burned internally. Thirty-two years, four months and sixteen days since he started working for the Transit Authority, Garrity found the pain too much to bear and arranged an accident to end his life. (Slingers#1 (Hornet Variant)/Slingers#8) - Garrity tried to stop Hornet from rescuing him from the path of two runaway subway trains. Firing a gun at Hornet, Garrity was able to briefly hold him back, but was eventually lifted off the tracks. Garrity ran off the moment he and Hornet hit the ground. (Slingers#8 (fb)) - Despising Hornet for extending his pain, Garrity gave into his burning anger, his body mutating into a rat-like form. (Slingers#2 - BTS) - The rats mutated in Garrity's accident gathered beneath the nearly-completed Grand Royale. Acting under Garrity's control, the rats ate one of the Maggia gunsels patrolling the area and attacked Hornet and Ricochet (who were there to investigate Maggia activity). The rats ran off during a cave-in. (Slingers#4 - BTS) - The rats lurked in the tunnels under the Grand Royale, watching Maggia boss Jimmy Eyes and his men load the remaining barrels onto a train. (Slingers#7 (fb) - BTS) - Garrity's evolved form, "the Griz", tracked Hornet's scent to ESU student Eddie McDonough and began stalking him. (Slingers#6 (fb) - BTS) - The Griz took control of the train transporting the barrels and killed the men operating it. (Slingers#6) - The Griz and his mutated rats tracked Jimmy Eyes for several days. Catching up to him, the Griz looked on while his rats seemingly ate Jimmy Eyes alive. (Slingers#7 (fb) - BTS) - The Griz sent rats to McDonough's dorm room to ambush him. (Slingers#7) - The Griz led his rats through the New York sewer system, feeding on two maintenance workers along the way. Arriving at Empire State University, the Griz's rats surrounded Eddie McDonough and pulled him through a manhole. The swarm carried McDonough into the Griz's lair, where McDonough fainted at the sight of the Griz atop a throne of human skulls. Chaining McDonough to a wall in preparation to kill him, the Griz was stopped by Dusk, who, with Ricochet, followed the rats from Hornet's dorm room to the sewer lair. After giving McDonough his Hornet gear, Ricochet was knocked out and teleported away from the fight by Dusk. Their absence gave the Griz an opening to grab Hornet. (Slingers#8) - Unable to rescue Hornet from the Griz, Dusk stood by while he told them the story of the accident that caused his mutation and his attempted suicide that Hornet foiled. After Dusk's sudden departure, the Griz took Hornet to a sewage treatment plant to bear witness to his plan to dump the remaining barrels into a tank. Trying in vain to reason with the Griz -- telling him that someone like Reed Richards might be able to help him -- Hornet was thrown into the barrels, far enough from the Griz to access his gauntlets and mount an assault. Badly burning the Griz's flesh with his lasers but failing to stop him, Hornet was pinned, and the Griz threatened to throw him into a tank. The sudden arrival of Dusk, Ricochet and the "Ricochet-Mobile" knocked the Griz into a tank himself, and he was torn to pieces by the gears and sucked through the drain. Later that night, the Griz's rats collected his remains, putting him back together piece by piece. As his body was nearly reassembled, the Griz awoke. (Dark Reign Files) - Quasimodo researched Griz for Norman Osborn. (Wolverine: The Best There Is#1 (fb) - BTS) - To earn some money Griz became a fighter in an illegal fight club. After slaying several dogs, the hillbillies he worked for, found him a bigger challenge and caught Wolverine in a bar, restraining him with a depowering restraining collar. (Wolverine: The Best There Is#1) - Wolverine decapitated Griz and escaped after Griz accidentally crushed the collar during combat. (Gambit V#17 - BTS) - Griz survived and ended up imprisoned at Pace Federal Penitentiary. (Gambit V#17) - Griz was one of the prisoners, which also included Icemaster, Lightmaster, Mandrill, Vic Slaughter and Supercharger, taking Borya Cich's offer to kill Gambit, who had broken into the prison, for one million dollars or 100,000 for aiding in his death. 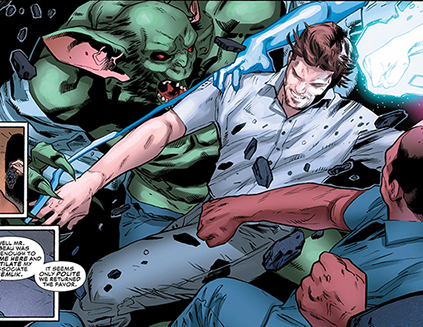 He participated in the battle, which was soon joined by Gambit's friends from MI13 and the Avengers Unity Squad. The prisoners failed to kill Gambit. Comments: Created by Joseph Harris (writer), Chris Cross (pencils) and Rob Stull (inks). Slingers#1 shipped with four different covers, each spotlighting one of the four leads. More than just a cover gimmick, each variant included different story pages, eight near the beginning of the issue giving a different interlude with each character plus eight near the end of the issue with a different view of their actions during the train disaster. 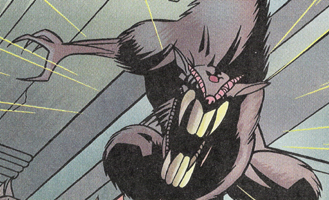 The Griz was named for the sound Garrity made while speaking in his mutated form. 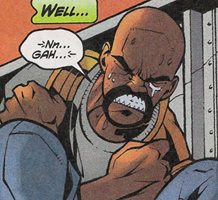 He's identified as the Griz on the cover to Slingers#7 and in the letters column for several issues, but not in the stories themselves until the end of Slingers#8. The Griz's post-Slingers status hasn't been revealed, but you've got to wonder what he's doing since Hornet was killed over in Wolverine III#23. 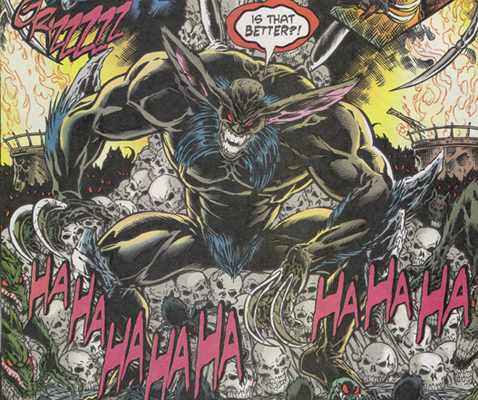 And, while Wolverine was recalling things from the perspective of having gone into berserker mode, there is an image of the Griz's rats pulling his head back onto his body in Wolverine: The Best There Is#1. Wonder if he healed from that!